Tomcats – Seven years ago, a bunch of friends make a bet that’ll give the last remaining bachelor a ton of money. Now, after losing a ton of money at a Vegas Casino, Michael Delaney has to quickly get his friend Kyle married so that he can collect the prize money to pay back his debt. Finally a comedy, and a movie that Drew and JB just don’t see eye to eye on. Have a listen as we discuss the movie from top to bottom and cop a buzz from this week’s beer choice. The cast is pretty well known but early in most of their careers, and we both agreed that the funniest parts were in the blooper reel during the credits, but that does’t mean it didn’t bring a few laughs. Find out who liked it and who didn’t and let us know what you thought of it! Our good buddy Frank sponsored this episode by donating to our beer fund. I chose a beer with a cat theme which wasn’t that easy. 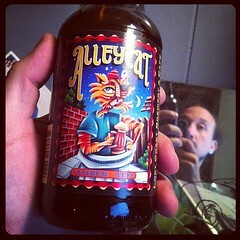 There was a lion, a tiger, and then just one cat, Lost Coast Brewery Alleycat Amber Ale. Listened to it yesterday, and guess which movie is on Dutch TV tonight. Will give it a miss I think. Probably your show would have been more enjoyable than watching the movie.